I came to the Whitworth Art Gallery on a sunny Thursday afternoon on a whim; a friend mentioned something about free opera and due to my current level of essay-induced mania I jumped at the chance to get out of the library for a little productive procrastination. I had no idea what to expect when I walked into the newly refurbished Great Hall at the gallery. I was one of very few spectators who weren’t part of the production due to an apparent failure by the Whitworth to advertise the event on any of their social media outlets, a real shame given the event took place a few hundred feet from campus and was free, reason enough to draw a sizeable audience from any group of students. As part of their Thursday Lates series, the museum first premiered two short films produced by local drama organization Tandem Theatre, introduced by the creators themselves. Developed from the personal experiences of homeless individuals, the two pieces, Second Knock at the Door and Spirals, explored the various disorientating and frustrating elements of the lives of those left homeless. With all the roles performed by either those who have lived on the streets or have worked to help people off them, both productions despite being non-professionally produced gave a genuine eye-opening portrayal of the humiliating and difficult journey many go through and the obstacles they overcame in order to ask for and receive help. With the majority of the cast members in the audience it was a somewhat rowdy and delightful crowd who whooped to see themselves and their friends on the big screen. The sheer delight of having participated in creating something was a pleasure to witness and so many after the screening were brimming with eagerness to share anecdotes and plans for future projects. The main event of the evening, the screening of The Passion took place immediately after the two short films. 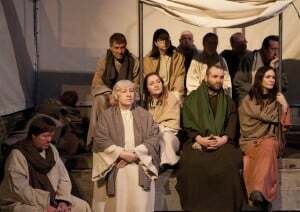 This collaboration between award-winning charity Streetwise Opera and world-renowned choral ensemble The Sixteen took the form of an interactive promenade piece originally performed at Campfield Market, in which the cast walked among the audience amongst various interactive sets. Tackling Bach’s complex St Matthew’s Passion, the group reformulated the lengthy German classic into a contemporary piece that accommodated the skill sets of all involved. Professional opera singers such as Manchester-born Joshua Ellicott performed alongside completely untrained members of Streetwise Opera in a piece that captivated with every aria and chorus. 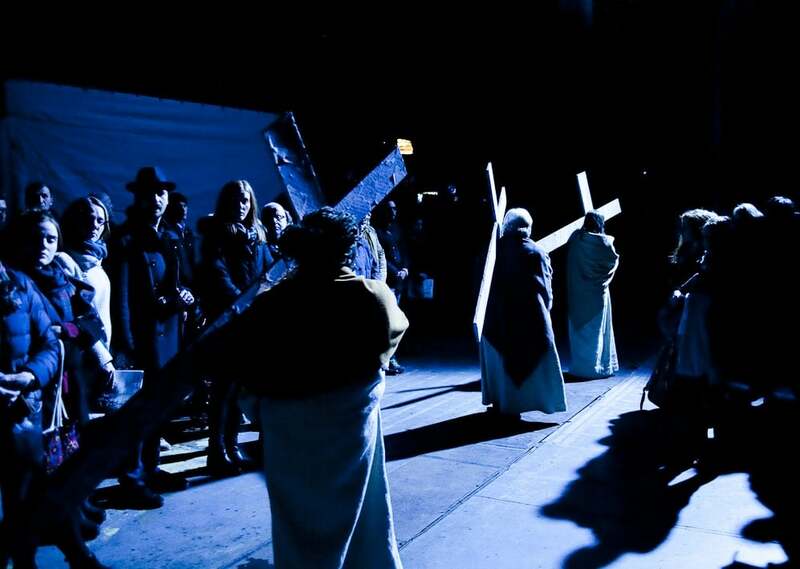 Director Penny Woolcock had the incentive to split the challenging role of Jesus into eight different interpretations all played by various members of Streetwise, the transition signalled by a piece of blue cloth transferred between the actors at various stages. An incredibly challenging production even for fully-trained and experienced performers, the Streetwise team were equally impressive as the rest of the cast, no flat note or wavering voice detracting from the overall effect of the piece. The most notable update from the opera’s original form was an uplifting resurrection chorus written by Sir James MacMillan for this particular production, which at the screening many of the audience members joined in with as the event drew to a rousing close. With all cast members congregated on the main stage, holding hands and many with tears in their eyes, professionals and amateurs were indistinguishable as they sung their final lines. I’ve seen a fair few operas in my time but few have impacted me as much as this surprisingly uplifting take on a famously depressing tale, carried out with unbelievable care and sensitivity to both the content and its performers. After the screening I spoke to the wonderful Mark who has worked with Streetwise Opera for over five years who was positively overflowing with praise for the programme. Having lived on the streets of Manchester, he first came into contact with Streetwise through their collaboration with The Booth Centre, who provided catering and support throughout the creation of the show. It was clear to see from the cast and team members of both organizations the confidence and positivity projects like this give people who have experienced incredible hardship. Having come merely by chance, I left feeling optimistic and uplifted in a way I’ve rarely felt before. I’ve always thought Manchester a city that drew its strength from its communities and to witness such love and support amongst these various groups was further affirmation for the many reasons I’m proud to call this city home. I only wish more people could have experienced the truly unique moment of watching the show alongside its creators. To witness a group of people who have gone through difficulties that few of us can imagine, to be so uninhibited, empowered and eager to share and create, is a powerful testament to the work of these wonderful organizations and furthermore the embodiment of true passion. To donate to Streetwise Opera or the Booth Centre, you can find the information on their websites. The Passion was broadcasted by the BBC on Easter Sunday and can still be seen on BBC iPlayer.